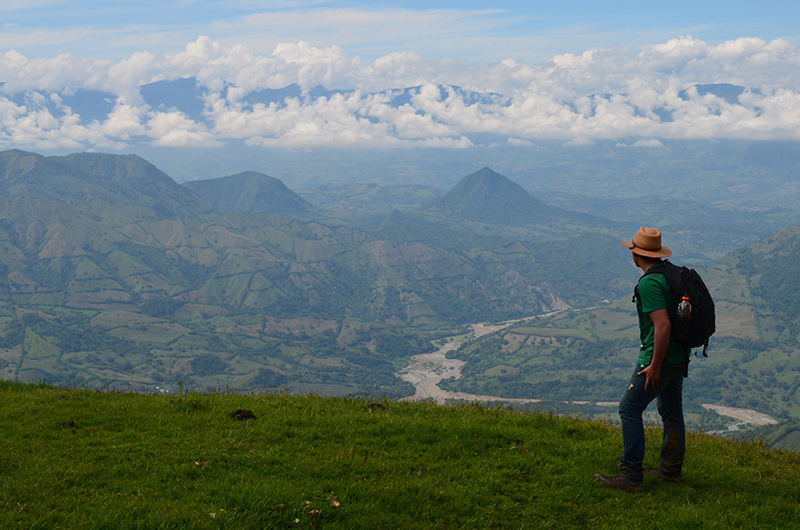 Panoramic view of the Cauca River canyon, Colombia, where rock layers contain crystals of zircon, sourced in the Panama arc of volcanoes seen in the background. The map shows the Western-Hemisphere continents playing footsies at the freakishly slender Isthmus of Panama. Since continents and tectonic plates drift through the eons, scientists have long thought the Isthmus geologically young. Before the isthmus formed, a deep seaway between the oceans separated South and North America. By looking at the surge of movement among animals between the two continents about 3 million years ago, scientists concluded that the Isthmus formed around then. Now, a study in Science looks at the rocks and and finds that the isthmus closed 13 to 15 million years ago. The study focused on zircons -- crystals that form when molten rock (magma) -- cools. New-formed zircons contain some uranium, but no lead, so any lead found in an old zircon had to originate in the radioactive decay of uranium. That makes zircons a favorite tool for dating in geology. First author Camilo Montes, at the University of the Andes in Bogota, Colombia, and his group extracted zircons from Panama and used uranium-lead dating to obtain a "zircon fingerprint" of magma that cooled in Panama between 65 and 39 million years ago. Rocks like this polished piece, from Panama's north coast, contain zircon crystals that will later be eroded and transported in water. Between 13 and 15 million years ago, zircon grains traveled along rivers from Panama to northwestern South America. Rollover image to see an electron micrograph of a zircon from Marathon County, Wis. The super-hardy zircon minerals survive most geological beatings and allow dating of the cooling rock in which they formed. They repeated the process in Northwest South America, near its connection to Panama, and found that most of those zircons were much older -- up to several billion years old. However, in geologic strata that were buried from 13 to 18 million years ago, they found some zircons carrying that Panamanian zircon fingerprint. "Within the time period when Panama had magmatic activity, we know from several locations that no zircons were forming in that part of South America," says Montes, "so when we found zircons of those ages, they must have come from Panama." 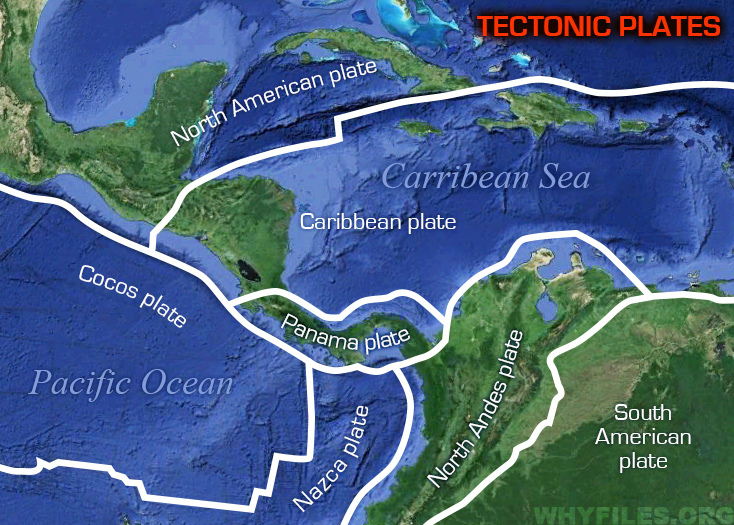 At this time, tectonic plates and geologic uplift were connecting Panama with Colombia, closing the deep, seawater channel separating the two lands. On left: Contemporary view of the Isthmus of Panama and region's plate arrangement.What did the Panamanian Isthmus look like during the middle Miocene (13 to 15 million years ago)? 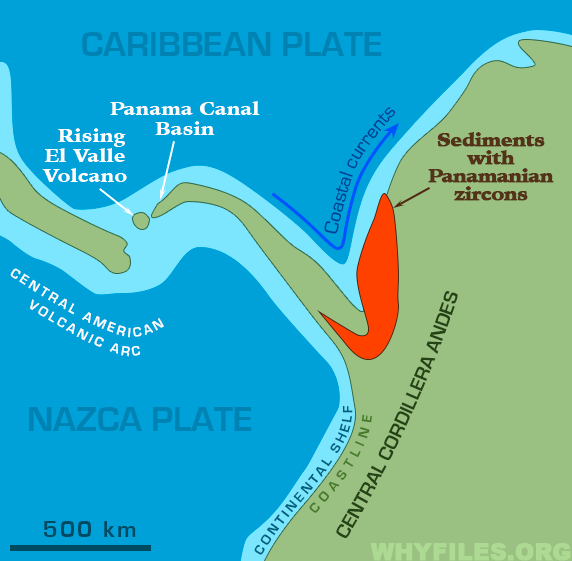 River sediment deposits found in Columbia with Panamanian zircons evince at least segments of the Panama volcanic arc had risen from the seafloor and bound with South America by this time. El Valle volcano was surfacing, so only shallow, intermittent seaways, if any, would have been allowed between the ocean basins. The next step in dating the seaway closure looks at transport: How did these zircons get from Panama to the continent? Zircons can travel through the atmosphere once lofted in a volcanic eruption. But that explanation fails for some of the young zircons found in South America, which apparently formed in molten rock that cooled underground. Zircons can move in coastal currents, but most of the Panama-sourced zircons were found in rocks that were deposited when sediment from flowing water settled in shallow coastal ponds. That's evidence of river transport, Montes says. 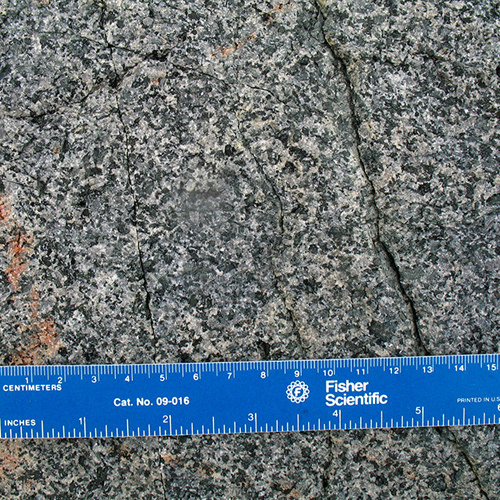 Middle Miocene sequence rocks (13 to 15 million years old) like this, exposed along a riverbed in northwestern South America, contain zircon grains that can be traced to a Panamanian origin. Now for the final bit of logic: Obviously no river could cross the seaway that once separated the continents. Hence the seaway must have disappeared 13 to 15 million years ago (that's the age of the rocks in which the zircons were found), so the land bridge -- the isthmus -- must have formed by then. Otherwise, those Panamanian zircons could not have reached Colombia. "We saw no Panamanian zircons that depended on water transport before 15 million years ago," Montes says, and that provides the early date for completion of the land bridge. 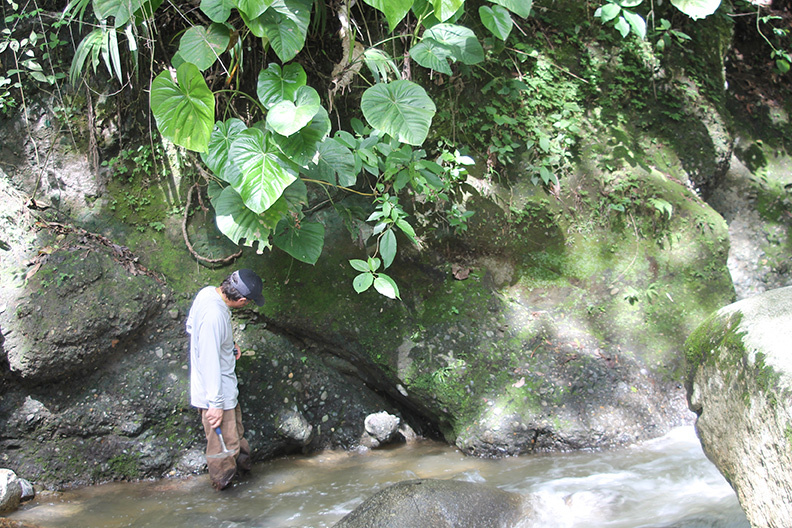 Based on different isotopic signatures of various bodies of cooled magma in Panama that appear in the zircons in Colombia, the river was very roughly 300 kilometers long, he adds. A succession of ice ages started about 3 million years ago, after the closure changed Atlantic circulation, causing the Gulf Stream to intensify and deliver more heat, moisture and snow to Europe. The snow reflected enough sunlight, according to this hypothesis, to cool the climate and trigger the ice ages. Fossils showed that plants and animals started changing hemispheres across the isthmus after the accepted closure date. The period between 3 and 5 million years ago "is where we see the largest pulse of plant and animal species introductions between North and South America," says Jack Williams, professor of geography at University of Wisconsin-Madison. The obvious inference was that a land bridge had recently united the continents. The Montes study "creates a major new biogeographic and evolutionary puzzle," Williams says. "If the land bridge between North and South America had formed by 13 to 15 million years ago, then why did it take 10 million years for species to really begin dispersing between these two continents? … 10 million years is a very long time, and it's hard to imagine what kind of terrestrial or dispersal barriers would keep species from moving between the newly joined continents." 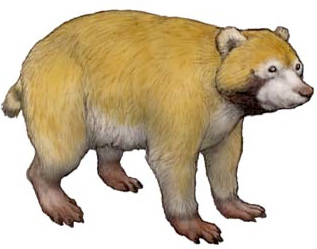 Convention says the earliest known mammal to cross the Isthmus of Panama, the raccoon-like ancestor of this creature from the genus Chapalmalania, did so by island-hopping to South America four million years before the agreed timing of the Panama land bridge. If the land bridge actually rose from the depths 13 to 15 million years ago, this early migrant might have forgone “hopping” altogether. Millions of years later, the Great American Biotic Interchange brought new species, and competition, to South America, eventually “offing” Chapalmalania. Why did it take so long? Some mammals were traversing between the continents as early as 7 to 8 million years ago, Williams adds. "The traditional explanation has been 'island hopping,' some mammals were able to make small jumps across narrow seaways, in their passage from North to South America, and so reached South America before the land bridge was fully formed. This paper's new evidence suggests that the land bridge had already formed before the mammal exchanges began. So, an early land bridge would help explain the early dispersal events, but wouldn't explain why the great majority of dispersal events was between 3 to 5 million years ago." In terms of the ice ages, and the Great American Biotic Interchange, Montes says, "The closure had nothing to do with these phenomena. We are saying Panama is not all that important; it's inconsequential."